Hey! How goes? I'm doing ok - been a while huh? Lest you think I've abandoned bikes for motorcycles or cars, or whatever it is people spend their time on, I'm still very much collecting. Picked up a few cool things over the last, oh, year or two since I posted anything actually bike related on here. I figure it'd be ok to show off a little. We'll start with this frame. 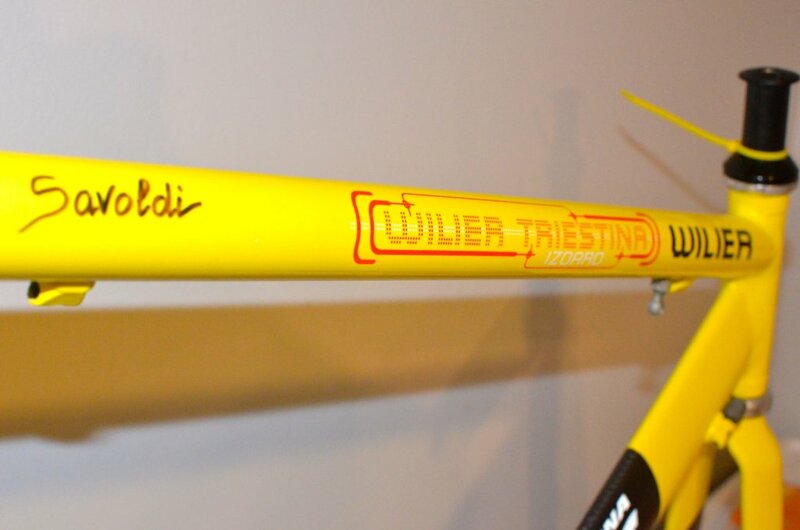 It's a 2002 Wilier-Triestina time trial frame, issued to Roberto Savoldi of the Mercatone Uno team. It was his last year with the team he got his start in as a stagiaire in 2000. Not a lot of documentation on these frames. It's labeled as an Izoard, but it's not - and doesn't really match up with anything I've seen in catalogs. Custom? Likely. 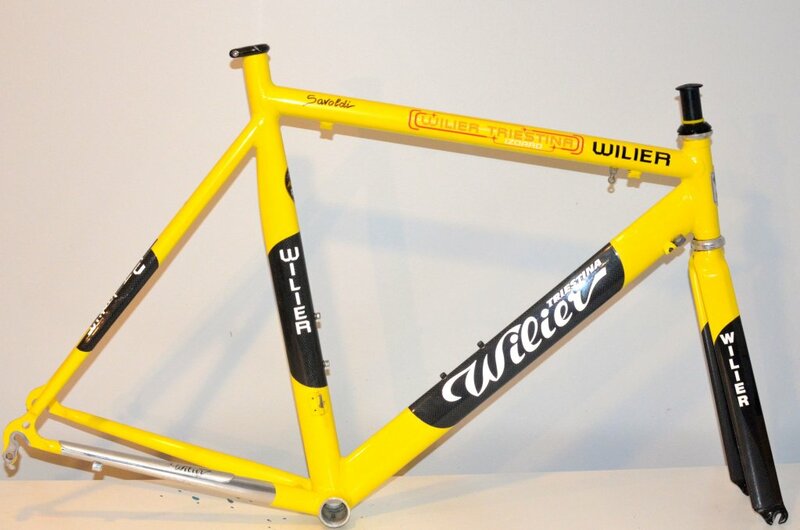 Built by Wilier? Maybe. It's aluminum - Easton Aero if we're to believe the label. 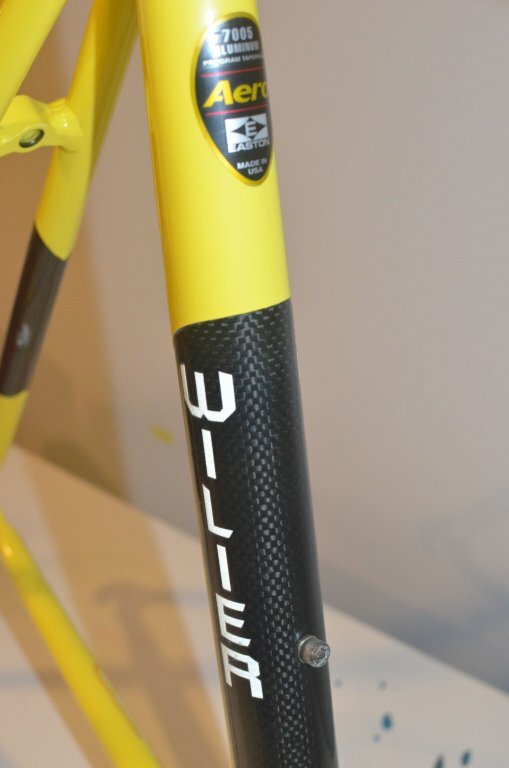 The carbon is a wrap on the tube - Wilier did this on the actual Izoard of the same timeframe. The claims were stiffer than, more dampened than mumble mumble mumble. I suspect it was a majority marketing and aesthetics. I suspect these frames were used the prior year by the Liquigas team - maybe even literally the same frames. Savoldi, and if we're honest, the entire Mercatone team was largely anonymous in 2002 - they barely left a mark on the Giro, and didn't get a Tour de France invite. They'd limp on - sans Savoldi - for another year before Pantani died in 2004. Hey Jeremy, I have a few very interesting Mavic items you may not have (I worked very closely with Mavic when I was Cannondale sports marketing director and liaise with Saeco,Barloworld and Liquigas teams. That said, I'm also into Campy mtb parts, and have a recent interest in getting a set of Syncro II shifters for a retro build. I'm in the LA area - haven't trolled around enough to find out where you're from yet... anyway, let's talk! Rory - drop me an email and I'm sure we can figure out how to get a set of Syncro II's in your hands. jrauch at gmail.